In the wake of a deadly attack on a U.S. synagogue, people of faith from across the Greater Toronto Area gathered at Jewish places of worship on Saturday in an act of defiant solidarity. More than 200 attendees from various religious backgrounds formed "rings of peace" around 10 synagogues throughout the region on the Sabbath, a weekly day of observance in Judaism. The events were organized by several Muslim community groups and included prayers, hymns, statements of support and an opportunity to meet neighbours. "It is our faith that keeps us together. 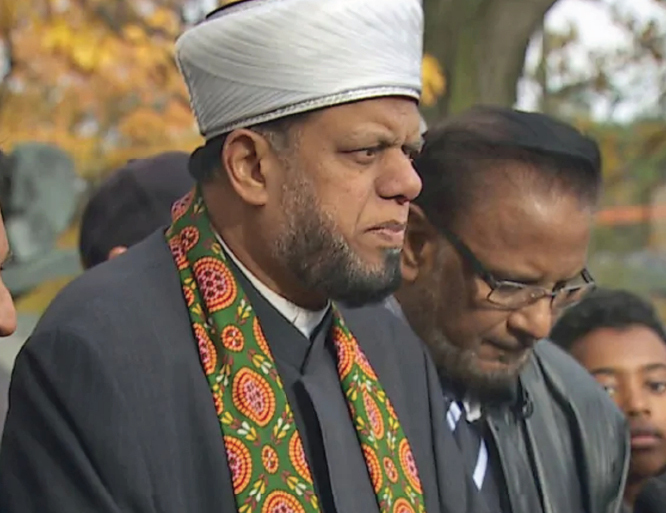 When one person is hurt in our community, through our moral and religious obligation, we are supposed to help," said Osman Khan, spokesperson for the Imdadul Islamic Centre, one of the groups behind the show of solidarity. Last Saturday, a gunman opened fire in the Tree of Life synagogue in Pittsburgh, killing 11 Jewish people, many of them elderly. Six people were also injured in the attack, including four police officers. The accused shooter, Robert Bowers, allegedly made anti-Semitic remarks during the attack, according to police. It was just the latest of a series of a high-profile shootings at places of worship on both sides of the border. Khan said it only made sense for his community to express its condolences and support for Toronto's Jewry. In February 2017, some 300 Jewish people from across the GTA, along with many from other faiths, formed rings of peace around local mosques in the wake of a deadly attack inside a Quebec City mosque. "It gave consolation to us in that difficult time, and now are doing the same," Khan said. "Not because we feel we have to reciprocate, but because we feel a need to be with our brothers and sisters to ease the pain that they feel, because we share that pain." Joanna Sadowski, a member of the Holy Blossom Temple on Bathurst Street in York, said the public display of compassion was deeply emotional for her. "It was very moving and very, very beautiful. I think I felt a little bit overwhelmed by the support of all the people who came out to show their solidarity," she said. "I think the message is that people want to feel safe in prayer and in community, no matter your religion, no matter your background. That's a value that we share as Canadians, as Torontonians — that we care and respect each other's differences." Phyllis Denaburg, also a congregant at Holy Blossom, took part in the circles of peace around GTA mosques last year. She said that beyond offering support, the events help connect people who might otherwise not have a chance to meet. "It's definitely a message of solidarity and that we aren't alone. It's a shame that these things still continue to happen, because it's not something new. But it does warm our hearts," she said. Holy Blossom Temple's rabbi, Yael Splansky, has said that Toronto native Joyce Fienberg, who was killed in the Pittsburgh shooting, was a member of Holy Blossom Temple. Fienberg spent most of her career as a researcher at the University of Pittsburgh, retiring in 2008 from her job studying learning in the classroom and in museums. Before that she was a member of the Holy Blossom Temple community, which is one of Toronto's oldest Jewish congregations. Splansky said Fienberg was a "very special person" who was married at the temple and whose confirmation photo is on its wall of honour. "I know there's a whole generation of Holy Blossom members who grew up here with her, who went to school with her and celebrated her wedding day here at Holy Blossom," said Splansky, who said she didn't know Fienberg personally. If you have been praying for victory, [O believers] - victory has now indeed come unto you. And if you abstain [from sinning], it will be for your own good; but if you revert to it, We shall revoke [Our promise of aid] - and never will your community be of any avail to you, however great its numbers: for, behold, God is [only] with those who believe ! Whenever the Prophet asked permission to enter, he knocked the door thrice with greeting and whenever he spoke a sentence (said a thing) he used to repeat it thrice.